Because of a club meeting and vote on Monday, we are having our practice today. It was a small group today: Bernard, Cory, Mike B., and I were there. 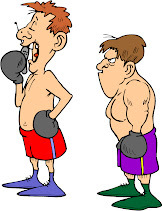 The Judge passed through the boxing room near the end of our workout and said hello, but did not train with us. Bernard can't be there tomorrow, so this was our only scheduled group workout this week. We'll be back on our regular Monday-Wednesday schedule next week. Here's the breakdown of today's workout. That makes 19 rounds plus the roadwork. Not too bad. I am looking forward to resuming a regular schedule next week. Of course, not long after that I will be going on vacation for a while, but things don't work out perfectly, do they?